This month we acknowledge National Pet Fire Safety Day. I can think of nothing more horrifying than losing your pet to a fire while you are away from home. 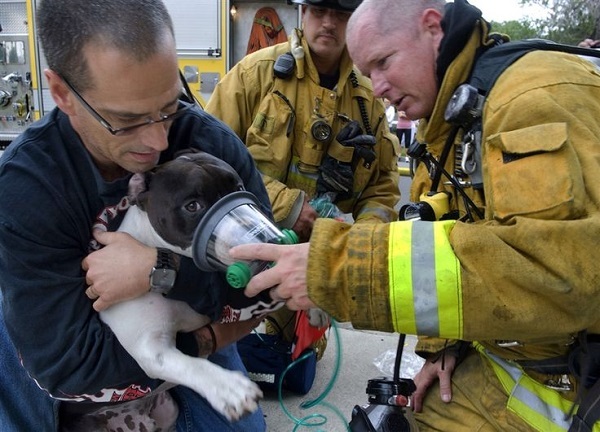 According to the AVMA (American Veterinary Medical Foundation), 40,000 pets die in residential fires each year, most from smoke inhalation, and 500,000 pets are affected overall. So very sad. Many house fires can be easily prevented. It takes a little preparation on our part, but it’s so worth it. We have to avoid thinking that “it won’t happen to me”. Unfortunately, there are many people who can tell us otherwise. Fires grow and spread quickly. If your pet is fortunate enough to escape the flames, he may still become a victim of smoke or heat. Let’s talk about some measures that we can take to minimize the risk of a fire and to make sure that our pets can get out if it does happen. Keep Pets Near Entrances When Away From Home – Keep collars on pets and leashes at the ready in case firefighters need to rescue your pet. When leaving pets home alone, keep them in areas or rooms near entrances where firefighters can easily find them. Secure Young Pets – Especially with young puppies, keep them confined away from potential fire-starting hazards when you are away from home such as in crates or behind baby gates in secure areas. Since Pets Left Alone Can’t Escape a Burning Home – Consider using monitored smoke detectors which are connected to a monitoring center so emergency responders can be contacted when you’re not home. These systems provide an added layer of protection beyond battery-operated smoke alarms. 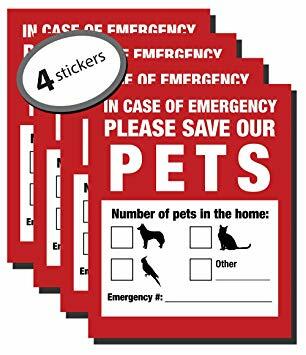 Affix a Pet Fire Safety Sticker – Write down the number of pets inside your house and attach the static cling or sticker to a front window. This critical information saves rescuers time when locating your pets. Make sure to update the number of pets listed. Believe it or not, pets are actually the cause of many house fires. I had a cat when I was younger and we had a heck of a time trying to keep her off the kitchen counters. No matter how many times we would chase her out of the kitchen, we would find her back at her escapades just as soon as we turned our backs. Sure enough, one day she ignited her tail on the gas stove. Fortunately, my mom had just walked into the kitchen, and grabbed a dish towel and put out the fire. She was lucky and wasn’t injured. We were lucky our home did not catch fire. The National Fire Protection Association states that household pets are responsible for over 700 house fires each year in the United States alone. Remove stove knobs – Be sure to remove stove knobs or protect them with covers before leaving the house. According to the National Fire Protection Association, a stove or cook top is the number one piece of equipment involved in your pet starting a fire. Invest in flameless candles – These candles contain a light bulb rather than an open flame and take the danger out of your pet knocking over a candle. Cats are notorious for starting fires when their tails turn over lit candles. Beware of water bowls on wooden decks – Do not leave a glass water bowl for your pet outside on a wooden deck. The sun’s rays when filtered through the glass and water can actually heat up and ignite the wooden deck beneath it. Choose stainless steel or ceramic bowls instead. Train your pet to stay off the kitchen cabinets. If your dog is beginning the bad habit of counter surfing, we can help. Contact our Trainers. Our Professional Dog Trainers can design a personal training program to accomplish your needs. Check and repair any loose wiring in your home. Electrical connection problems are often loose and can cause electrical fires in homes. Plus, if cords are damaged they can short out, spark, and start a fire. To make sure you are reunited with your pet should he or she escape due to a fire, make sure they are wearing a collar and identification. Microchipping is recommended. Make sure to change the batteries in your smoke detectors on a regular basis… not just when they start beeping. Finally, all households should have an emergency plan so that everyone knows how to get out of the house and where to meet should a fire occur. Your plan should include determining the safest and quickest route out of the house and how to escape from a window if needed. Make sure your pet is included in that plan, designating who is responsible for which pet and being able to grab a leash or carrier on your way out of the home. We have taken many precautions at Holiday Barn Pet Resorts to make sure our guests are safe in the event of a fire. Our facilities were designed to prevent the risk, as well as provide an escape for our precious guests. We are a “campus” style resort for many reasons. One of those is to be able to isolate pets during something catastrophic. It would be very unlikely for more than one building to catch on fire. We have 9 separate buildings at GA and 8 at JW. Our facilities are bordered by 8′ fencing. In the event of a fire, we can let the dogs out into our secured property. Cats will be contained in carriers to remove them from the building. Our completely enclosed “Katio” would also provide an escape for cats if needed. Both facilities have smoke and fire detection systems that are monitored by the alarm company. Our local fire departments visit our facilities annually in order to make sure we’re following the best practices and to also gain a familiarity with each building. To top it off, in Glen Allen, we are right next door to Henrico County Firehouse #15. Error: Error validating access token: Session has expired on Monday, 29-Oct-18 09:08:51 PDT. The current time is Thursday, 18-Apr-19 19:36:55 PDT.